The weekend of 17th and the 20th of September has been very exciting for our Foundation, as the Annual Conference of the Pulmonary Hypertension Association of Europe (PHA Europe) has taken place. We have been able to become a part of this great family, with whom we will join forces to fight against pulmonary hypertension. In this event 73 participants of 32 countries have participated who have made us feel welcome and have shown why this entity keeps growing as the years go by. This gathering has strengthened the bonds with other countries and the development of mutual investigations about this rare disease. On the 17th, Enrique Carazo and Patricia Fernández, president and vice-president of the Fundación Contra la Hipertensión Pulmonar (FCHP), arrived to Castelldefells. On the same day, there was the welcome lunch and after that, the new developments of PHA Europe were discussed, in which we can highlight the incorporation of FCHP as a full member of the PHA Europe. Since that moment, we were able to enjoy the excellent program prepared by the organizers, which included presentations of the latest news related to lung transplant and the treatments which are currently available for this pathology. On the next day, the representatives of our Foundation were absent momentarily from the PHA Europe event, as they had to assist to another event. The foundation had a market stall at the “Feria de Calella”, where we sold solidary brooches in order to raise funds. We even had the opportunity to make our cause known to the mayor of this location, Montserrat Candini, and to the president of the association “Súmate”, Eduardo Reyes Pino. They have both decided to commit in supporting our cause with their public representatives. You can see a few photos of the event if you click here. On that same day, Enrique Carazo returned to the PHA Europe gathering and on Saturday our dear friend Maria Rotger joined the event. She has done a praiseworthy job by voluntarily translating, helping in letting our Foundation reach further and have better international representation. Enrique Carazo and María Rotger. On Saturday, some associations from different countries shared their experiences. Such as the one from Ukraine who talked about the care and support towards patients. The one from Latvia, who is working on creating the Alliance of Rare Diseases. The Croatian association talked about the reimbursement of the medicines related to Pulmonary Hypertension. Another example was Macedonia, who explained how they use reinvestment of their taxes of tobacco to fund the investigation of rare diseases. On the last day of this wonderful event, there were talks were the main topic were the different projects for the future of different associations and of the impact of the new clinical guides related to patients with Pulmonary Hypertension. Throughout these days, we have had the participation of different pharmaceutical laboratories, such as Bayer, Actelion, United Therapeutics Corporation o GSK. They have always support these types of events, which are destined to improve the health of Pulmonary Hypertension patients. During this event, we have had the opportunity to transmit to our European fellows the importance of our project EMPATHY and the campaigns of awareness and donation that we are organizing such as “Grupo Teaming Pequeños con Hipertensión Pulmonar”. We have also shared the experiences with members of the “Asociación Nacional de HP en España”, with whom we have established bonds, which will be very important for the future and the wellbeing of the patients. “This has been a great experience for me and for my entity, whom I have the pleasure of representing. First of all, I would like to thank the members and the organization of PHA Europe for allowing us to form part of this family, and especially to Gerald, Pisana, Juan, Bárbara… and many other people for their incredible work. I would also like to thank Patricia Fernández (vice-president of FCHP) and Maria Rotger for her extraordinary work as a volunteer translator. We have many challenges ahead, and I am sure that all together and with the strength that I have felt during this congress, we will manage to overcome them. 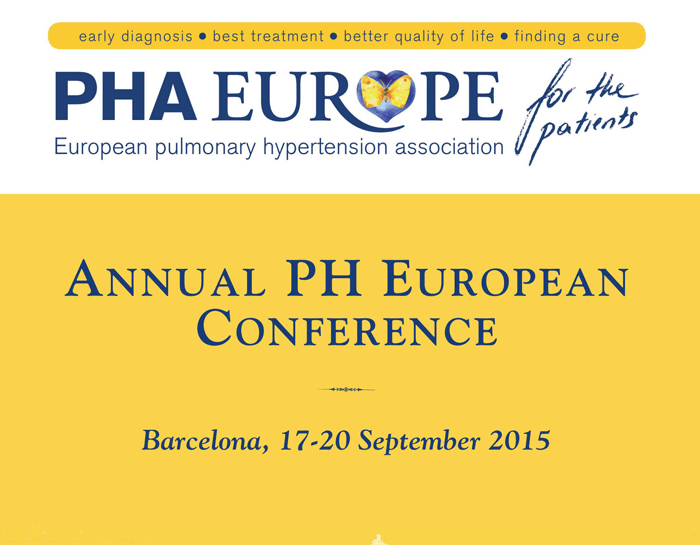 We are many associations that integrate PHA Europe, and we all work towards the same goal. I would have liked to talk everyone, but it was not possible. This is why, from the FCHP we impatiently wait for the next meeting, where we will strengthen our bonds and form new ones. We promise you, that next year we will have many new projects on which we are working on with great motivation”.